Check out this roundup up of DIY wedding favor ideas at your own risk. They're all so awesome, you'll want to make them all! Share your love of coffee or tea with your guests. Make this DIY coffee bean wedding favors, which look just as warm and inviting as the drink it will make. Just a few paint sticks and you can make these lovely DIY key chains as a souvenir. Show your appreciation for your entourage with this special DIY bracelet — the perfect wedding souvenir with a personal touch. Everybody wants something nice to take home from a wedding. A funfetti cake candle might not taste as great as a wedding cake, but it smells delightful and lasts way longer! Give them something delicious they can enjoy at home. What is Funfetti? A funfetti is a type of plain cake frosting with rainbow sprinkles. This is an offering by Pillsbury which is also known as the confetti cake. If you have a photo booth for your wedding, then this DIY photo holder is the perfect complement. It's definitely a double treat your guests will never forget. Make your own soap and add some stencils to make it the perfect handmade soap wedding giveaway. You might also want to check out these homemade soap recipes for ideas. Don't these party favor containers look stunning and elegant? Fill them up with small treats that match your wedding theme. Wrap these adorable cupcakes individually, and you have a sweet wedding giveaway. It's a fun DIY craft which will pretty much take the stress of wedding prep away. Had a few bottles of wine during your bachelorette party? Put those wine corks to good use with this upcycling project. You might also want to check out these DIY wine cork crafts ideas for more wedding favor ideas with wine corks. Some mini wine bottles and this printable will make an easy DIY wedding favor. Any of these wine bottle crafts may also work great as wedding party favors. This may not look like match—er, much (pun intended), but it sure is one cute DIY wedding favor. 12. Say It with Diamonds! Want to treat your friends to beautiful personalized handmade goodies? Customize your own banners and wedding decor over on Etsy! Send hugs and KISSES to your guests with these pretty nifty sweets in a bag as your wedding favors. Just a gorgeous little keepsake any guest will surely love. A little Baking 101 and you have this DIY wedding party favor in the bag! Make DIY wedding favors with unique scents for a truly memorable experience for your guests. Give some cheer in the spirit of celebration with some inspirational and loving words. Messages in a bottle are fantastic home decor your guests will appreciate for their own home. These potted herbs may be a bit bulky to take home, but this favor will really show love grows—even in a pot. Plant-lovers or not, your guests will appreciate your thoughtfulness. Your guests will never forget your wedding if they have your pictures in the favors. 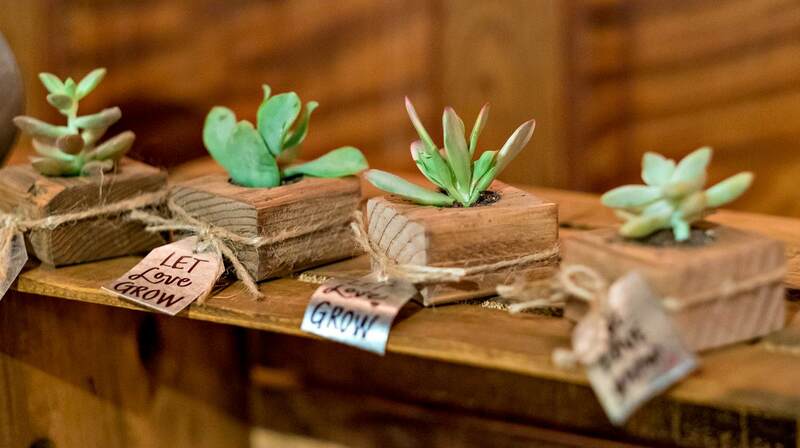 If you're up for some DIY rustic wedding favors, this one couldn't be any more perfect. Keep the flame burning with this fire starter favor made from pine cones. Put them in a nice box with a message, so your guests are still left with something to remember your day even if the firestarter is used up. Try this raspberry jam recipe and make a tasty wedding favor for your family and friends. One of the perks of a DIY buff is you can't run out of party favor ideas, from upcycled crafts to tasty edibles. Jars make such great storage for gifts and giveaways. Put some unpopped popcorn inside and add a printable. These will make great popcorn wedding favors. Is there anything more adorable than a mini wedding cake? If you feel at home with baking, then this DIY wedding favor is easy as pie. Looking for useful wedding favors? How about a mason jar craft as a wedding favor? Just add some decoration and you're good to go. Looking for DIY rustic wedding favors? This cute wooden magnet is one of the DIY wedding favor ideas which are easy to make. Just cut some wood, sand it, stamp, and glue your magnet! No wedding is complete without wedding favors because it's a time-honored tradition. But what makes them more exciting is the effort and thoughtfulness you put into them — these DIY wedding favor ideas are proof. Did you enjoy our list of DIY wedding favor ideas? Let us know in the comments section below! Editor’s Note: This post was originally published 0n April 17, 2017, and has been updated for quality and relevancy.